Today’s age of space travel presents an exciting new frontier, from the prospect of space tourism to NASA’s plans to visit Mars. But while the future remains an inspiring prospect, the past should never be overlooked: that’s why Kennedy Space Center Visitor Complex in Florida opened Heroes & Legends featuring the U.S. Astronaut Hall of Fame ®, a modern tribute to the astronauts that first left the planet and established mankind’s monumental milestones. 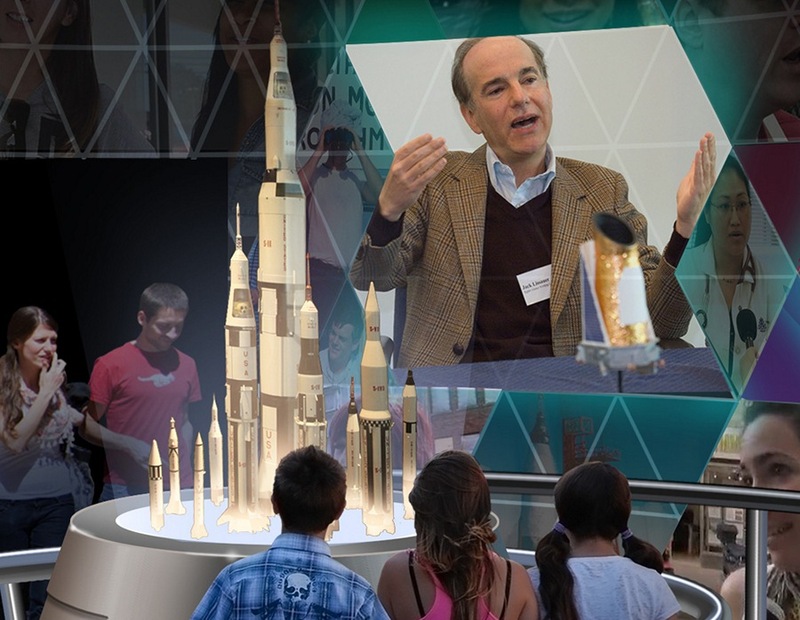 The new exhibit honors these brave men and women through a high-tech interactive experience, part of which includes a massive video screen that envelops visitors with dazzling 6K stereoscopic footage. Rendering video at such high resolution using traditional CPU hardware can present a time-consuming process – something that the Heroes & Legends creative designer, Falcon’s Digital Media, knows all too well. Early on during the project, the Florida-based studio realized it would be a challenge to achieve an aggressive deadline using existing rendering tools and render farm resources. A new solution was needed and, after putting its dizzying GPU-based render speeds to the test, Redshift proved to be that solution. Read on to learn how the Falcon’s Digital Media team expanded its horizons across this galaxy-spanning project. 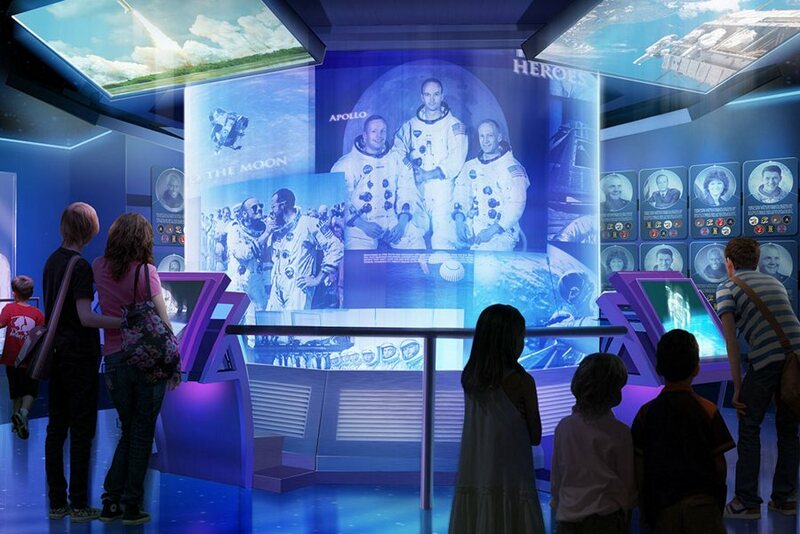 The centerpiece of Heroes & Legends featuring the U.S. Astronaut Hall of Fame® is its huge “Through the Eyes of a Hero” stereoscopic screen theater experience. Visitors can walk onto elevated tiered platforms where they are surrounded by a massive compound curve screen that wraps around and below the audience. The theater comes alive with vibrant visuals, sweeping sounds, atmospheric lighting, and blowing wind. Audiences relive exhilarating moments from the Mercury, Gemini, and Apollo programs, in first-person through the eyes of astronauts. The imagery is blended together by 14 projectors working in unison. Given the immense size of the dome, the media content needs to be rendered at a very high resolution to look as crisp as possible on screen. Rendering complex CG footage at increased resolutions can take an incredible amount of time with CPU-based software, something that posed a challenge for the team at Falcon’s Digital Media. Coggin had already dabbled with Redshift after learning about its abilities. He was skeptical having witnessed issues with other GPU rendering solutions, but couldn’t deny the results he was seeing with Redshift. He even drew up immense CG scenes packed with millions of particles and trillions of polygons, attempting to pinpoint some unseen, critical weakness in Redshift. “I was really trying to break it,” he admits. When that didn’t happen, he shared the exciting news with his team. Redshift was the breakthrough Falcon’s Digital Media needed to execute Heroes & Legends on schedule. However, the wider team first had to be convinced of the huge departure from its traditional CPU setup. The team chose to test an array of hardware setups and configurations, ensuring that Redshift would meet the varied needs across the studio. The results were impressive. The studio initially expected to use Redshift as a supplementary renderer, picking up the load from its existing render solution. “As the results came in and we were seeing such high-quality imagery at a significantly faster speed, we decided to convert the entire show to Redshift,” says Ambler. The team planned to keep just one sequence running through its previous render solution due to the fact it had already been shaded. However, with each frame taking upwards of 26 hours to render, the choice was made to route the scene through Redshift instead. With Redshift, each frame only took just one hour to render. Falcon’s Digital Media converted that scene along with the rest, and Heroes & Legends became a Redshift show. And while the speed increases were dramatic, they were not the only reason switching to Redshift made so much sense for Falcon’s Digital Media: the results also looked better overall. Falcon’s Digital Media previously relied on a render farm of some 200+ CPUs, but was able to quickly ramp up its GPU supply to embrace Redshift. Now the studio has 15 active nodes, each with four GPUs inside, providing a total of 60 primary GPUs for Redshift rendering. The majority of these nodes run the cutting-edge NVIDIA GeForce GTX 1080 GPU; one of the most advanced graphics cards ever produced. However, Redshift can also work wonders with lesser and more affordable technologies – Falcon’s Digital Media also renders on workstations throughout the night, and those machines run last-gen GTX 970 GPUs. The ability to speed through renders with Redshift – even working at 6K resolution – has opened up the creative process at Falcon’s Digital Media, allowing the team to go back and pour more attention into iterations. This has resulted in such tangible details as added atmosphere and texture detail, without the concern of limited polygon counts. “The amount of creative time we’ve been able to put into this show and to take it even further has been significant,” affirms Ambler. Early reception from visitors to Heroes & Legends has been overwhelmingly positive, but it’s not the only exhibit the team has worked on. Falcon’s Digital Media uses its myriad of talents to deliver immersive experiences the world over. Its next big focus is a The Hunger Games attraction for the Hollywood studio-based MOTIONGATE(tm) theme park opening in Dubai, for which they’ve planned to Redshift once again. 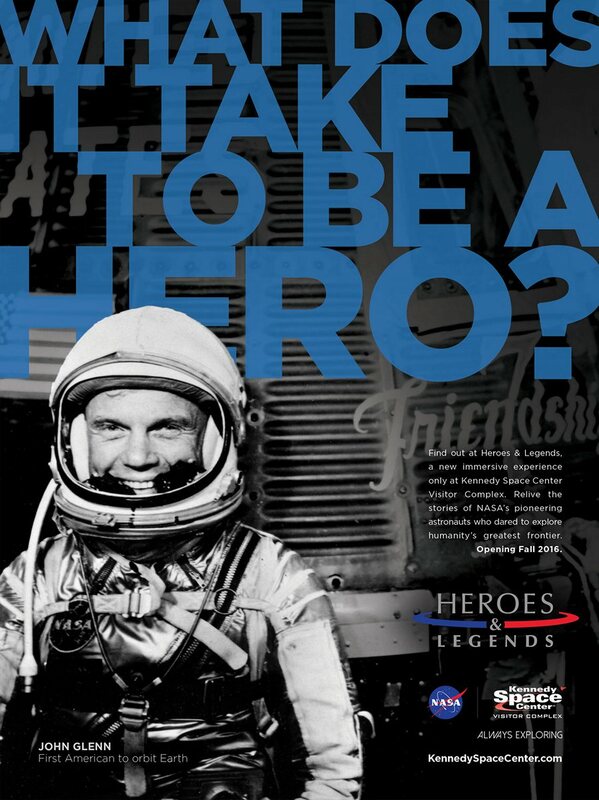 Yet Heroes & Legends featuring the U.S. Astronaut Hall of Fame® stood out as something unique and important, a respectful and sincere project that detailed humanity’s history in an awe-inspiring manner. Having the right technology was just one part of the story – but an important one.